As some investors feared, Apple on Tuesday reported numbers that were worse than its performance a year ago for the second quarter—though the company still saw record sales for its March quarter. While Wall Street is sure to take a dim view of Apple’s quarterly performance, it’s worth noting the company had a large bar to clear to surpass the second quarter of 2012. In that year-ago quarter, Apple saw profit nearly double to record levels for the March quarter on the strength of the strength of the third-generation iPad’s debut. 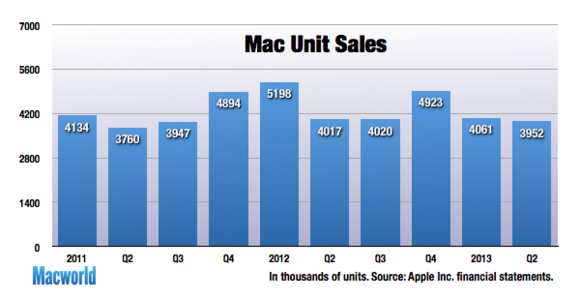 In the just-completed quarter, Apple didn’t introduce any new products. 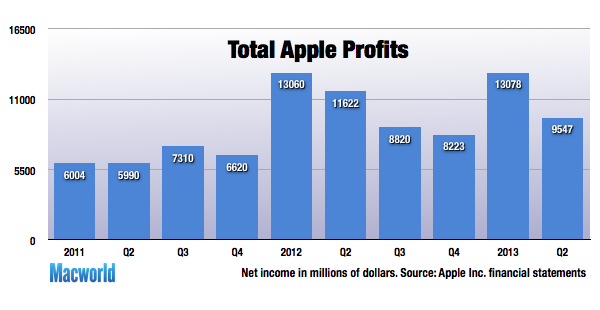 Apple’s gross margin for the quarter was down nearly 10 percent from the year-ago quarter: 37.5 percent for the 2013 quarter, compared to 47.4 percent for the second quarter of 2012. On an earnings call with Wall Street analysts, Apple CEO Tim Cook acknowledged that Apple’s growth rate has slowed, and that its margins have decreased from 2012. Cook pointed out the advantages of 2012, including favorable foreign currency and historically low component costs—while further referencing the iPad mini as a lower-margin Apple product. 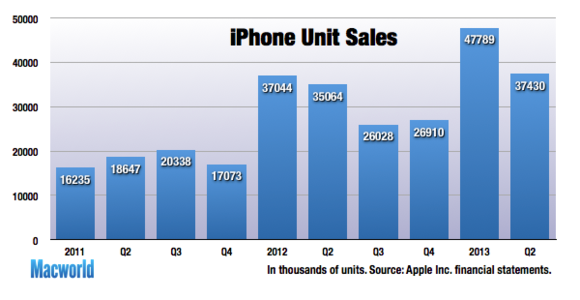 Two-thirds of Apple’s revenue in the second quarter came from international sales. Asked about smartphone market share, Cook said, “The smartphone market has always been competitive”—though he pointed out that the names involved change: It used to be RIM as the biggest competitor, and now it’s Samsung. “We feel we have the best products by far. We continue to innovate in products,” Cook said. He added that Apple has the best mobile ecosystem by far, and that it plans to keep augmenting it. 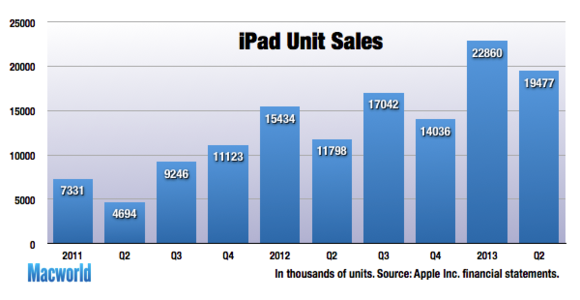 iPad sales soared year over year: 19.5 million tablets were sold in the second quarter of 2013, compared to 11.8 million in the year-ago quarter. That’s an increase of 65 percent year over year, and Apple reports that the tablet saw very strong growth in every geographic market, especially China and Japan. The company says that both the iPad and iPad mini remain extremely popular, with significantly more iPad mini sales in the second quarter than the previous quarter, which included the holiday season. The overwhelming majority of iPad mini purchasers are new to the iPad, too. And Apple says that the iPad mini is no longer supply chain-constrained. Cook cited the iPad’s performance in China in particular, where sales were up 138 percent in China during the quarter. Cook says that Apple sees a lot of opportunity in China, due to the large number of first-time smartphone buyers, including customers interested in iPhone 4. Apple’s total business grew 11 percent in the Greater China region to $8.8 billion in revenue. Of the Mac specifically and the PC market in general, Cook said, “I don't think this is a bad market or a dead market by any means ... We're going to continue to innovate in it. We're going to continue making the best personal computers. Our strategy is not changing.” He pointed to recent Apple innovations like the Retina display in the MacBook Pro as an example of Apple’s continued investment in Mac development. Demand for Apple’s music players continues to shrink, with iPod sales falling from 7.6 million in the year-ago quarter to 5.6 million this year. Still, the iPod remains the dominant product in the MP3 player market, and the iPod touch makes up most of those sales, according to Apple. The company preferred to draw attention to its digital content business in the form of the iTunes Store. 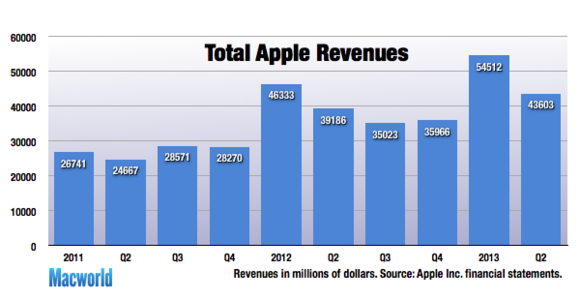 Apple recorded $2.4 billion in revenue from iTunes during the quarter, a record tally. According to chief financial officer Peter Oppenheimer, Apple’s online emporium of music, movies, books, and apps now tops $4 billion in quarterly billings, making it the largest digital content store in the world. Apple also announced what it calls “a significant increase” in its stock buyback and cash dividend programs. Apple says it expects to use “a total of $100 billion of cash under the expanded program by the end of calendar 2015”—representing an increase of $55 billion to the program first anounced last year. The program includes a massive increase in Apple’s share repurchase program—from $10 billion last year to $60 billion now. Apple says it’s “the largest single share repurchase authorization in history.” The company also says it expects to use $1 billion per year to net-share-settle vesting restricted stock units. For the third fiscal quarter this year, Apple is continuing its trend, started earlier this year, of providing its guidance with ranges. The company predicts revenue between $33.5 and $35.5 billion, with gross margin between 36 and 37 percent—which would be down slightly from its second quarter performance. The company predicts operating expenses between $3.85 billion and $3.95 billion. Apple no longer provides a forecast on earnings per share. 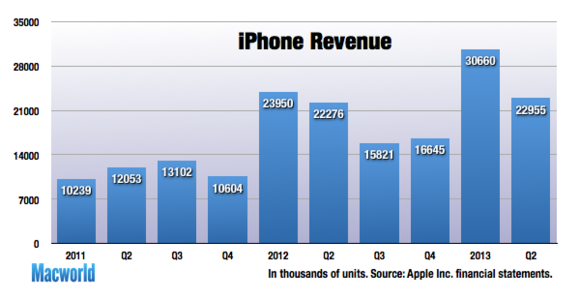 In the the third quarter of 2012, Apple reported $35 billion in revenue with earnings of $9.3 per share, indicating that the company expects to remain fairly flat year over year for the third quarter in 2013. Updated at 5:12 p.m. ET with details on Apple’s dividend program enhancement. Updated at 5:28 p.m. ET with further details on iOS device sales and revenue. Updated at 5:43 p.m. ET with more quotes from Cook, details on China, and other information. Updated at 6:12 p.m. 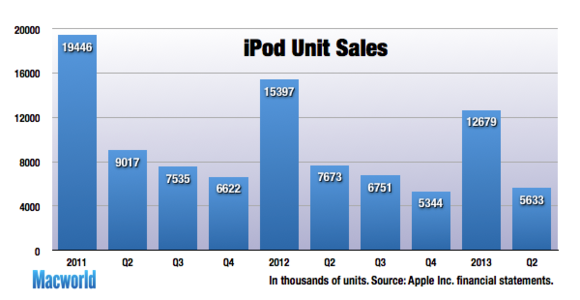 ET with charts and further details on iPod sales.